Bonampak is at the farthest reaches of Chiapas near the Usumacinta River in the Selva Lacandon — a rainforest jungle that is almost three hours from Palenque. It’s one of those magical places that I have dreamed of visiting but never imagined I might get to. 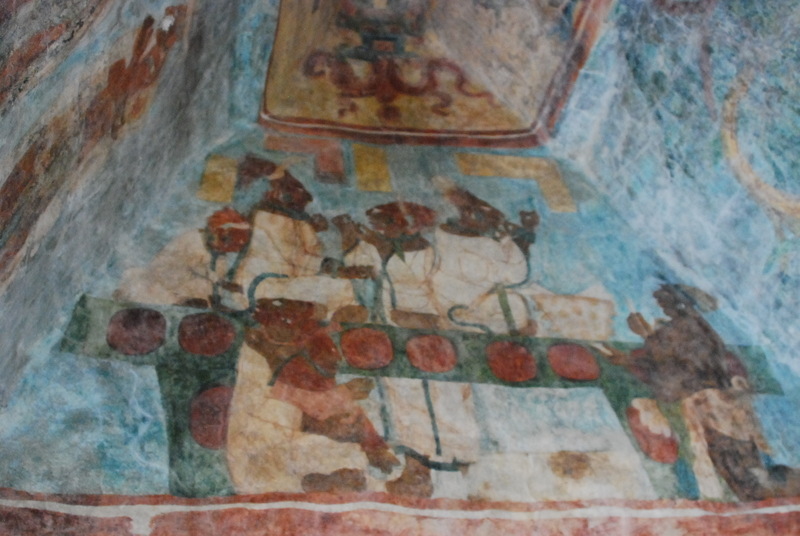 To get as far as Palenque and not go another three hours to Bonampak would have been a mistake. 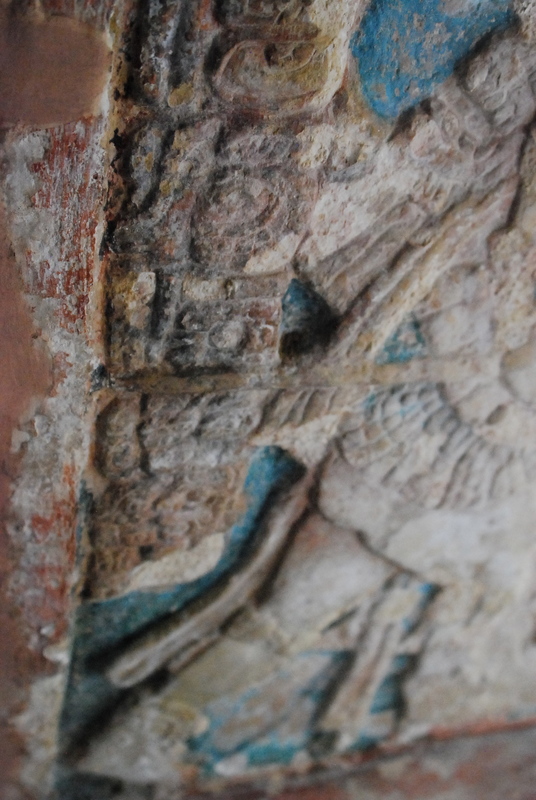 At the Palenque archeological museum and gift shop I bought Arqueologia Mexicana magazine, Vol. 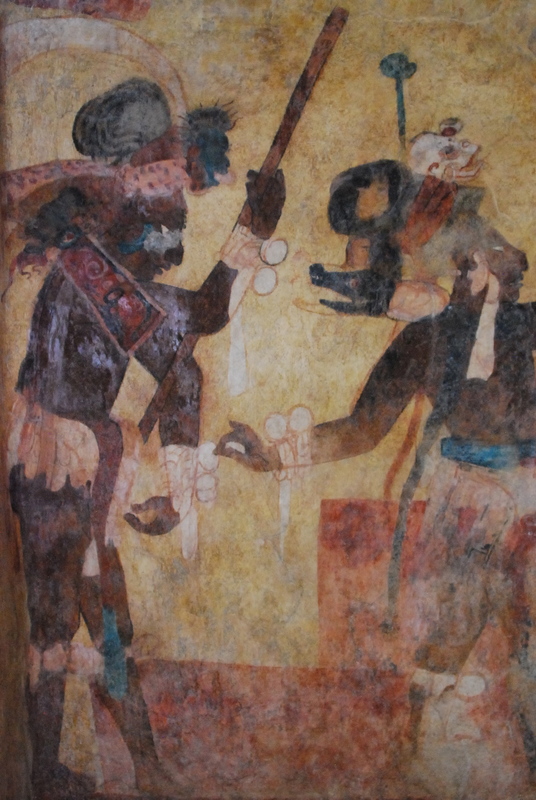 X, Number 55, that features the most recent reconstruction of the Bonampak murals. 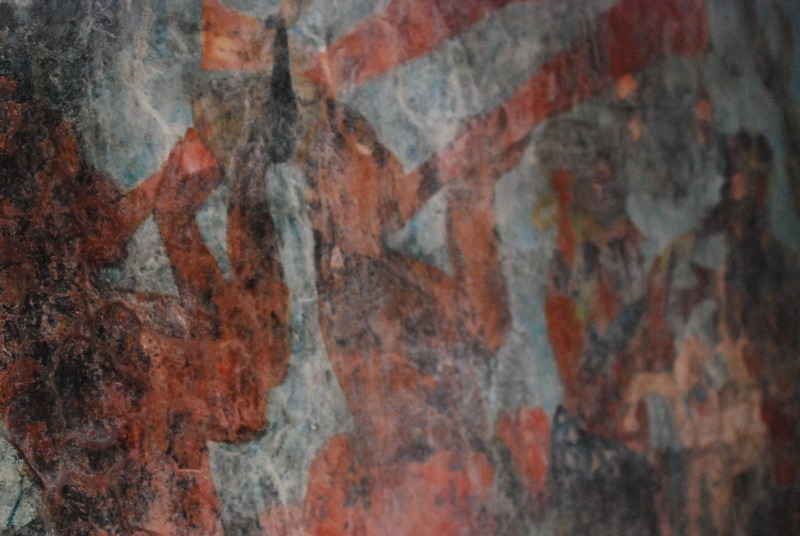 Since not all the paintings are clear and have degraded over time, archeological artists have attempted to reconstruct them using accurate colors and now infrared drawings. The magazine discusses (in English and Spanish) past interpretations, controversies and the most current reconstruction that uses the natural plant and mineral pigmentation. 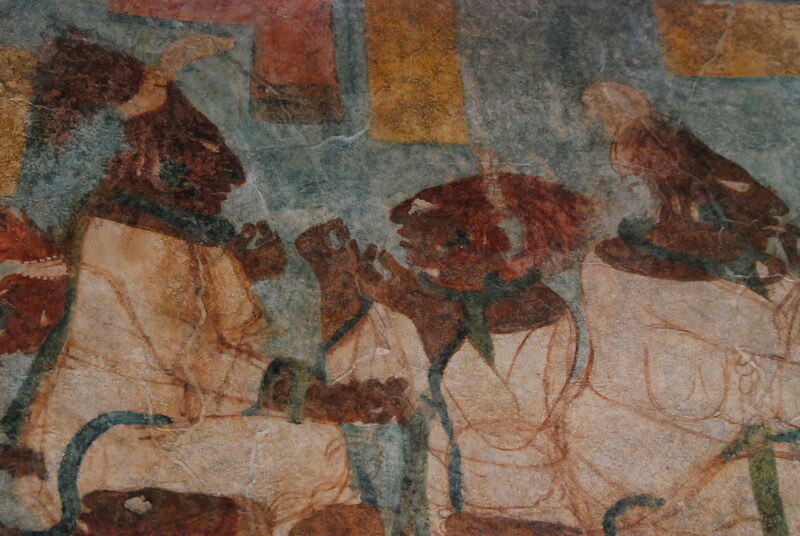 Bonampak was part of the Yaxchilan alliance and was a smaller Mayan center. However, the discovery of the murals in the 1940’s overshadowed its more magnificent neighbor which I will write about in my next post. It takes a special effort to get there and plenty of patience. The tour vans leave Palenque at 6 a.m. and you don’t return until 7:30 p.m. It’s a long day, but definitely rewarding. 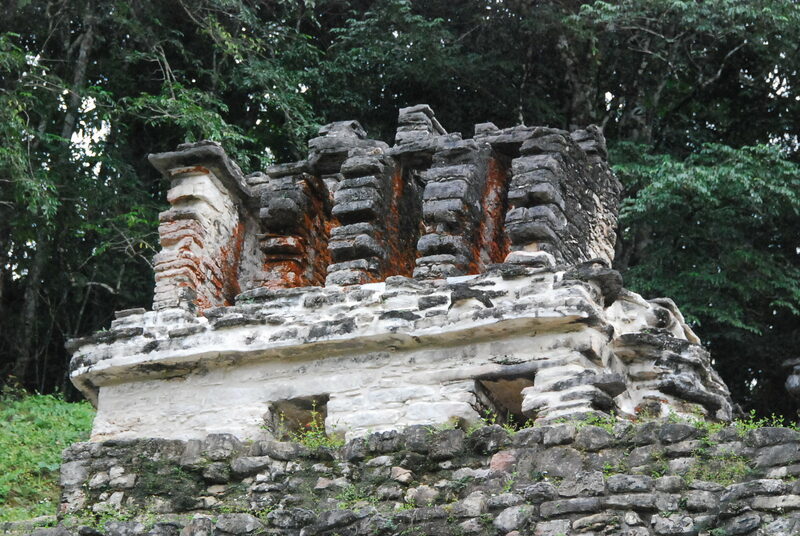 I took more than 80 photographs at Bonampak and can only show you a few of them here. Plus, there is lots of information online about the political, social and cultural history of place if you are interested in reading more. As I mentioned in the previous post, I’d recommend staying at a lodge either at Yaxchilan or Bonampak so you have two days to enjoy these two extraordinary sites. 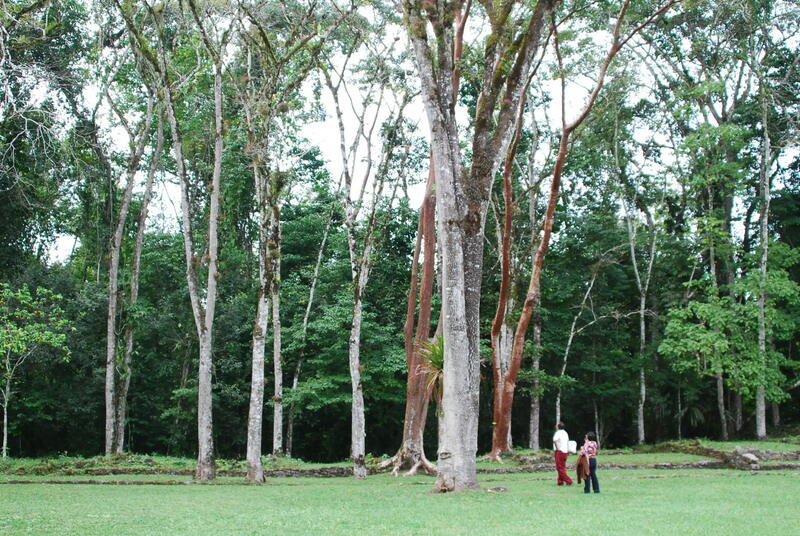 One day is too rushed since day tours give only two hours at Yaxchilan and one hour at Bonampak. I told them we didn’t need an hour for lunch or 45 minutes for breakfast! 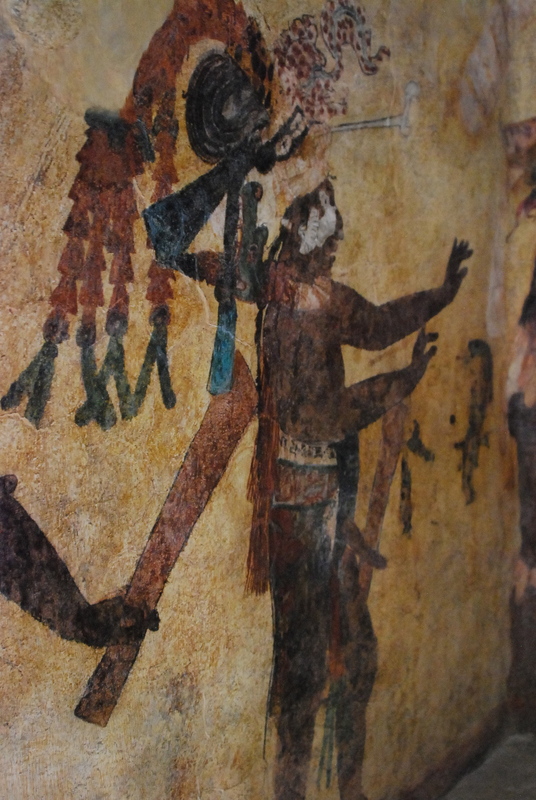 This entry was posted in Cultural Commentary, Oaxaca Mexico art and culture, Photography, Travel & Tourism and tagged anthropology, archeology, blogsherpa, Bonampak, Chiapas, Mexico, murals, Oaxaca, Palenque, photography, travel, Yaxchilan. Bookmark the permalink. 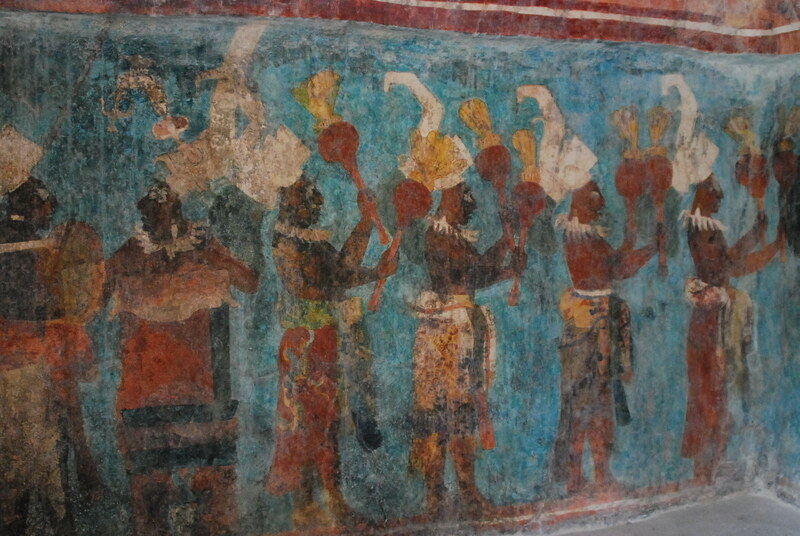 I am going to Bonampak in december and I can see you have taken a lot of photographs of the murals are there any restrictions on taking photographs at Bonampak. Hi, Nathan. 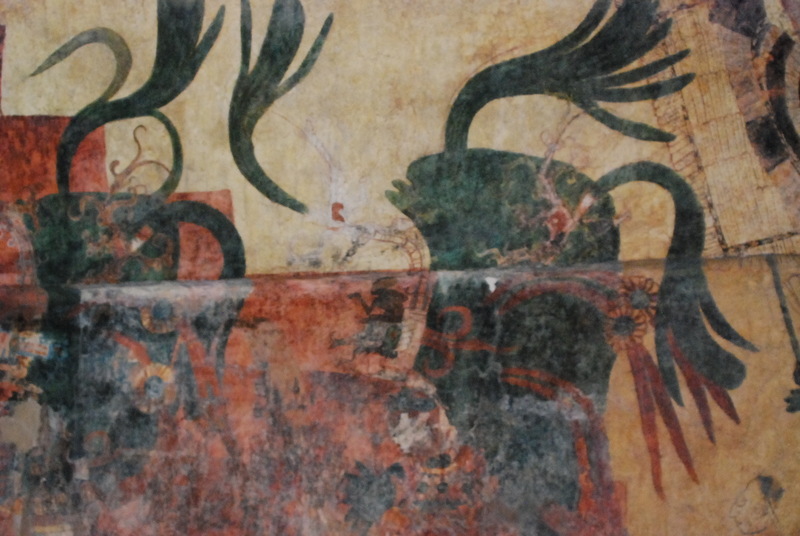 There are no restrictions on photography at Bonampak. 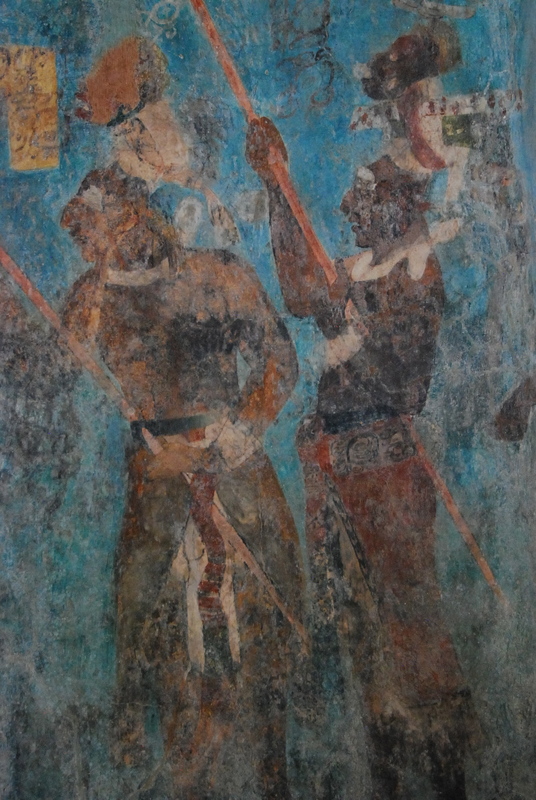 The murals are protected and visitors stand behind a plexiglas half wall. It’s dark inside. The light is very obscure, so you will need to use low light settings on your camera with high ISO. Thanks appreciate it…really looking forward to it. 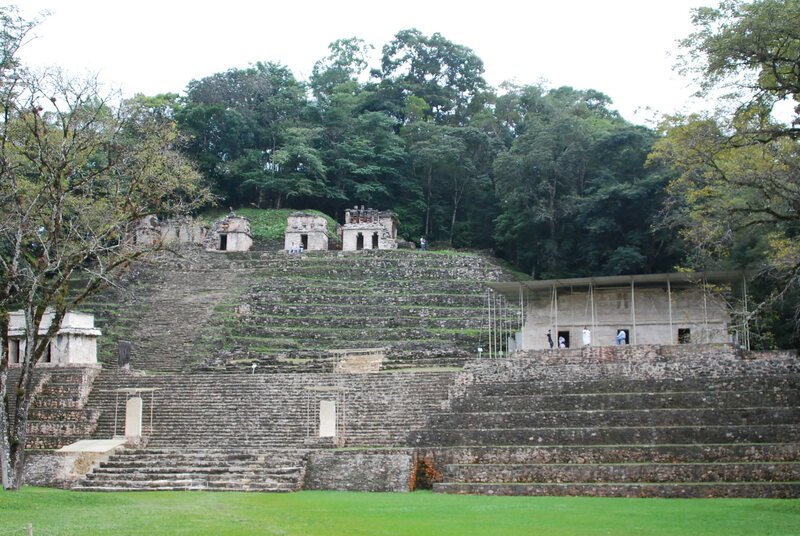 My girlfriend and I are planning a trip from Palenque to Yaxchilan and Bonampak. We have a bit of a tight schedule (two days), but would like to spend those two days in that area. I’m trying to figure out the how to get down there and ensure a ride back up on the 2nd day. Do you have information on the best way to do this? What are the prices of the one day tour vs. transportation costs of splitting up the trip? Recommendations for places to camp? Hotels? Cabanas? Justin, the cost of the one day trip is 800 pesos per person. You can arrange this through any of the travel agencies or your hiatal or posada. I recommend staying at Posada del Abuelito. If you want to travel down and spend the night contact Daniel from the Lacandon guide service. He will arrange for the transportation for you. The tourist vans also do one way trips and you could arrange to go down one day and return the next. 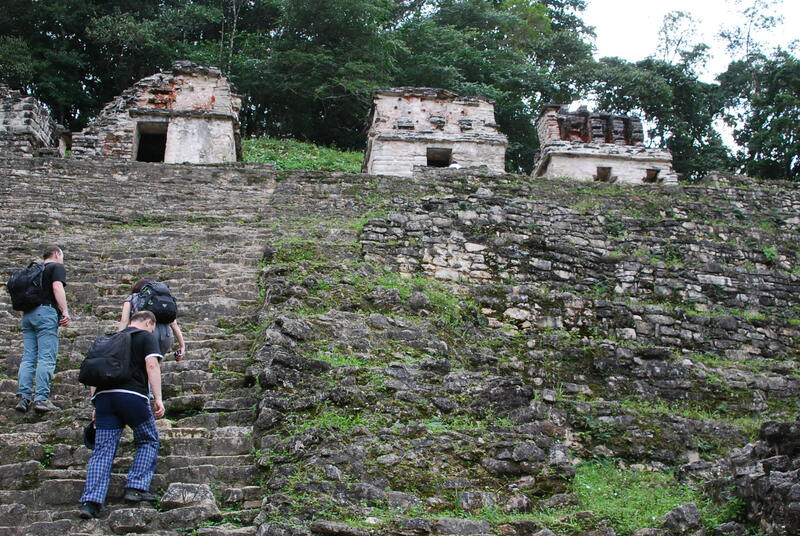 But I think you need a guide service to get to Yaxchilan.